In the previous lessons we learnt about straight lines, figures formed by straight lines. Are there figures other than these? What about our universe?, The earth goes around in the ecliptic path. Moon follows a circular path to go around earth. We also come across objects such as coin, wheels, cycle tires, rings. They are all in circular shapes. In this lesson we shall study their properties. ‘Circle’ is a closed curve on a plane, with every point on the curve at equal distance from a fixed point. The fixed point is called center of the circle and is denoted by O. In the figure, points P,A,Q,R and S are at same distance from O. ‘Radius’ is the line segment joining the centre of the circle with any point on the circle. It is denoted by r. There are many radii. In the figure OP,OQ,OA are radii. OP=OA=OQ. ‘Chord’ is a line segment joining any two points on the circle. In the figure, AQ and RS are two chords. ‘Diameter’ is the line segment passing through the center of the circle and having its end points on the circle. 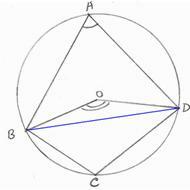 It is denoted by d.
‘Circumference’ is the distance around the circle (perimeter of the circle). In the figure, the distance measured from point P to P through the points A, Q, S and R is the circumference. Circles having same center but different radii are called ‘Concentric circles’. C1, C2 and C3 are 3 circles with different radii OA, OB and OC but with same center O. Different circles having same radii are called ‘Congruent circles’. C1 and C2 are 2 circles having same radii OA(OA=OB) but with different centers. ‘Arc’ is a part of the circle. The curve RS is an arc. ‘Segment’ is a part of the region, bounded by the chord and the arc. In the figure, RXSR is a segment. A chord divides the circle into two parts. Correspondingly we have two segments: minor and major segments. ASBA is a ‘minor’ segment. Chord AB is the diameter. ASBOA and ACBOA are ‘semi’ circles (regions bounded by equal arcs ASB,ACB and the diameter AB). ASBA is a ‘major’ segment. 6.9.2.1. In a circle, the perpendicular from the center to the chord bisects the chord. Data: In the adjoining figure, O is the center, AQ is the chord and OB is perpendicular to AQ. Data: In the adjoining figure, O is the center, PQ and RS are 2 equal chords. OX and OY are perpendiculars to PQ and RS respectively. 6.9.2.3. Chords of a circle which are equidistant from the center are equal. This property is converse of 6.9.2.2. Data: In the adjoining figure, O is the center, PQ and RS are the chords. 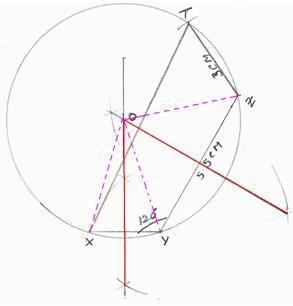 angle subtended by the same arc at any point on the remaining part of the circle. 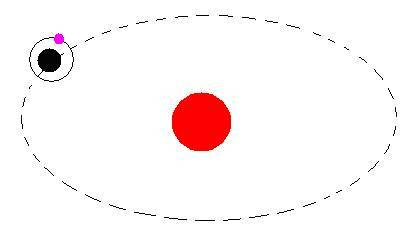 Data: In the adjoining figure, O is the center of the circle. 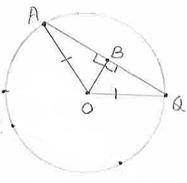 AOB is the angle subtended by the arc AXB, at the centre of the circle. 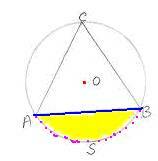 APB is the angle subtended by the same arc at any point (P) on the remaining part of the circle. 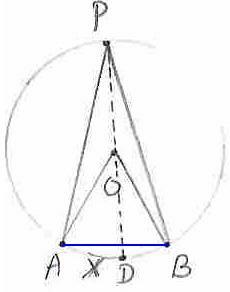 Exterior angle in a triangle ( AOP) is equal to the sum of two interior angles. Substitute result of Step 2 in Step 3. 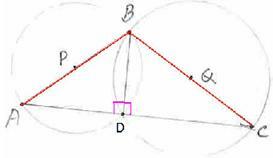 Exterior angle in a triangle ( BOP) is equal to the sum of two interior angles. Theorem : If two chords of a circle intersect internally or externally then the product of the lengths of their segments are equal. On the lines of 6.9.2 Problem 2 we can prove the above theorem when P is outside the circle also. 6.9.2 Problem 3: In the adjoining figure, AB and BC are diameters of two circles intersecting at B and D. Show that A, D and C are collinear. Given: AB and BC are diameters. 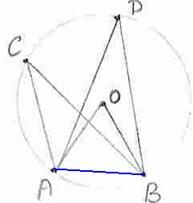 6.9.2 Problem 5: In the adjoining figure, the bisector of B of an isosceles triangle ABC with AB=AC meets the circumcircle of ABC at P.
1. Can we construct a unique circle given just a point? 2. Can we construct a unique circle given two non-collinear points? 3. Can we construct a unique circle given three non-collinear points? Note: Refer Section 6.4.3 to know more about circumcircle. 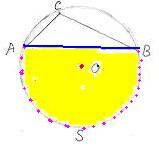 Since SA=SB=SC it is proved that S is the center of circle, passing through points A,B,C. This proves that there is only one circle which passes through three points which are not collinear. 4. Construction of a circle (need not be unique) given two points. Let A and B are the given two points. Let C be a point on the plane such that A, B and C are non-collinear. Draw perpendicular bisectors of AB and BC as above and let they meet at S.
The circle with S as center and SA as radius passes through B. Definition: A quadrilateral whose vertices lie on a circle is called a ‘cyclic quadrilateral’. It is an inscribed (inside a circle) quadrilateral. 6.9.3 Theorem: Opposite angles of a cyclic quadrilateral are supplementary (i.e. their sum is 1800). 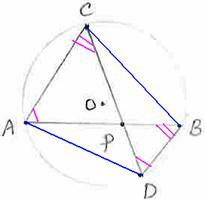 Data: ABCD is a cyclic quadrilateral and O is the center of circle. To prove: BAD + BCD = 1800 and ABC + ADC = 1800. Construction: Join OB and OD. Note that BOD is the central angle and BAD is the inscribed angle. This proves that opposite angles of a cyclic quadrilateral are supplementary (i.e. their sum is 1800). When we join BD, then we get two segments:BAD as a major segment and BCD as a minor segment on the same chord BD. 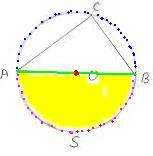 Theorem: Angles in the alternate segments of a circle are supplementary. Converse of above Theorem :( Proof not provided): If the opposite angles of a quadrilateral are supplementary, then it is cyclic. 6.9.3 Problem 1: Prove that the exterior angle of a cyclic quadrilateral is equal to its interior opposite angle. This proves that the exterior angle of a cyclic quadrilateral is equal to its interior opposite angle. that circle which is the fourth vertex of the quadrilateral. Step 5: Cut an arc of given length on the circle, to locate the 4th point. 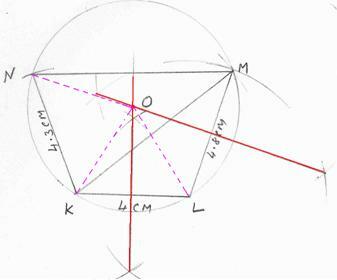 Construct a cyclic quadrilateral KLMN with KL = 4cm, LM = 4.8cm, KM = 6.8cm and KN = 4.3cm. (i) Draw the line KL=4cm. another arc of radius 4.8cm. Let they meet at M.
(iii) Join KM and LM to form the triangle KLM. 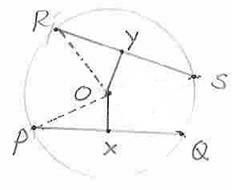 Construct a cyclic quadrilateral XYZT with XY= 2.5cm, YZ=5.5cm, ZT=3cm and XTZ = 600. Note: Since XYZT is a cyclic quadrilateral, the opposite angles XTZ and XYZ are supplementary and hence XYZ= 1200 . (i) Draw the line XY=2.5cm. (iii) Join XZ to form the triangle XYZ. 5. Draw the quadrilateral XYZT. Note: This is converse of 6.9.2.4.
and then by SAS property, prove that the triangles are congruent and hence show AB=CD. Note: There is one and only one circle passing through 3 non-collinear points. 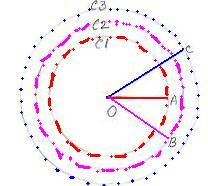 In a circle, the perpendicular from the center to the chord bisects the chord. Chords of a circle which are equidistant from the center are equal. Opposite angles of a cyclic quadrilateral are supplementary (i.e. their sum is 1800). The length around a circle or the perimeter of a circle is called its ‘circumference’. If ‘r’ is the radius of any circle, then the formula for the circumference is c = 2 r , where is a constant. We use its approximate value of 22/7 in all our calculations. The area of a circle = r2. 1) Aryabhatta of 5th century AD was the first one to give approximate value of to 4 correct decimal places (3.1416). The approximate circumference of a circle of diameter 20000 units is got by adding 62000 to the result of 8 times the sum of 100 and 4. The circumference (approximate value) of a circle is got by multiplying its diameter by 3927 and then dividing the product by1250. For simpler calculations, the circumference of a circle is got by multiplying its diameter by 22 and then dividing the product by 7. 6.9.5 Problem 1: Area of two circles are in the ratio of 25:36. Find the ratio of their circumferences. If r and R are the radii of the two circles then their areas are r2 and R2. 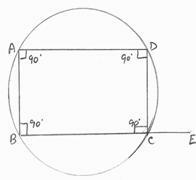 6.9.5 Problem 2: A well of diameter 150cm has a 30cm wide parapet running around it. Find the area of the parapet. Since the diameter of the well is 150cm, it’s radius = 75cm. Well can be imagined as a circle C1 having of radius OA(r) = 75cm as shown in the adjoining figure. Area of the circle C2 = R2 = 22/7*105*105 = 34650 sq.cm. Area of the circle C1 = r2 = 22/7*75*75 = 17678.6 sq.cm. Area of the parapet = R2- r2= 34650-17678.6 = 16971.4 sq.cm. so far is as follows. Given: ABCD is a cyclic quadrilateral. AC BD, MG CD, GM produced meets AB at H.